There’s been a shift in healthcare, like every other industry on the planet. That shift has been driven by cloud computing and a digital maelstrom eliminating paper charting and creating a patient population not of sick people — but of consumers of health care services. Today’s digitally savvy patients demand access, and cloud computing is the model they demand. While hospitals and health systems have been able to shift their operating models to incorporate digital technology, many small, independent practices struggle to keep pace. With hospital security breaches making the news every week, it’s clear that both cloud computing and on-premise software and hardware require a technology team to monitor these services. This article looks more closely at some cloud computing models for the small to mid-size practices, along with options for outsourcing IT to a managed service provider. 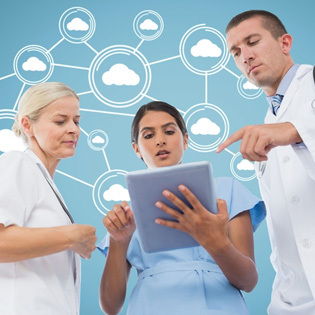 Are Cloud Computing Models Right for My Practice? True to cloud computing, most of these services are scalable and flexible, allow for some customization, and typically fall under the software-as-a-service model. Get a free assessment of how cloud computing models could change your practice. Is the Cloud HIPAA and HITECH Compliant? Today, the cloud is actually more secure than most on-premise applications. Cloud software is constantly being updated with the latest security patches or other updates. On-premise applications require unwieldy installations – which require valuable time and often lags behind the latest security threats. Cloud providers follow the HHS rule that data storage utilizes encryption technology to protect sensitive patient information. For moving data, cloud providers follow HHS rules requiring Transport Layer Security (TLS) to authenticate users and protect the data as it travels between the practice and the data stored in the cloud. Can IT Outsourcing Help Your Practice Move to the Cloud? IT outsourcing is just one service that you can incorporate into this model. Managed service providers can encrypt data and manage the network for security breaches. They can also set up a multi-tier authentication process that lies on top of traditional cloud security protocols to make patient data doubly safe. The managed service provider can assess your practice and its readiness for moving to the cloud, and make a migration roadmap. They can also assess existing technology and make recommendations as to what’s working and what isn’t. They can implement the plan, and then monitor your network full time for less cost than it would take to hire a full-time IT security and data management team. A managed service provider is also responsible for backing up your data and helping manage security, as well as creating a business continuity plan to keep your data safe and keep your practice running smoothly. Request a quote for managed IT services…..